Huge skirt expansion in target. Length may cause some mag issues. Predator Polymag 8 Grain .177 caliber pellets show very good manufacturing consistency. They also offer huge expansion of the lead skirt in the target, as is required for a good hunting pellet. The low Ballistic Coefficient means that they will be most useful for relatively short-range hunting with mid-power air rifles. At a lower unit price, they would be an easy Gold Award winner. Even at the price being asked, these Polymags still gain a HAM Bronze Award. As with other two-part hunting pellets, Predator Polymag pellets are expensive. This is understandable, given the obvious extra stages of manufacture involved in making and inserting the polymer tip into the lead skirt. However, hunters generally take relatively few shots and price may not be so important compared to effectiveness in this case. 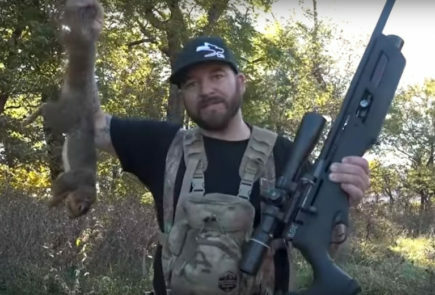 And, of course, by taking advantage of “buy four, get one free” offers from major online retailers, the 7.24 cents per pellet price can be significantly reduced for many hunters. 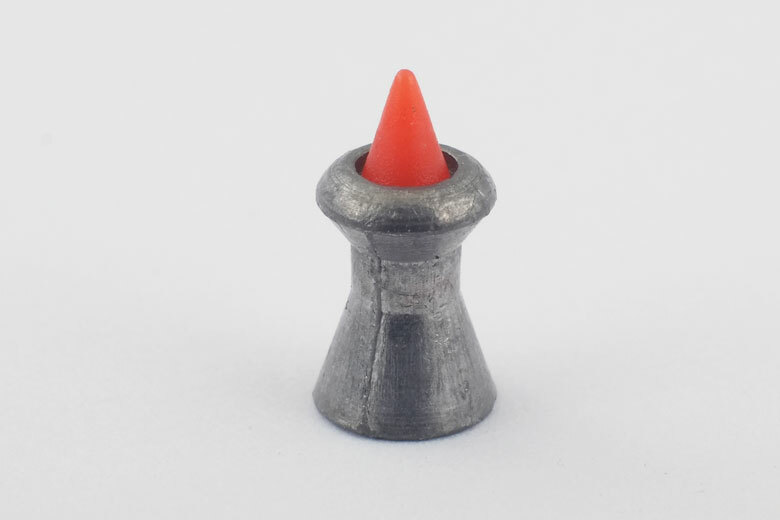 The polymer tip and lead skirt is intended to give both penetration and expansion in the target, combined with accuracy. This does result in a rather long pellet. However the .177 caliber Predator Polymag does fit into the common Benjamin Marauder/Umarex Gauntlet type of magazine, as well as that of the FX Impact, for example. (If in doubt, the Polymag Short version fits into all popular magazines and airguns). 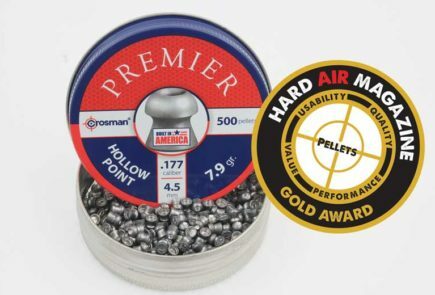 Predator International makes some big claims for these pellets. 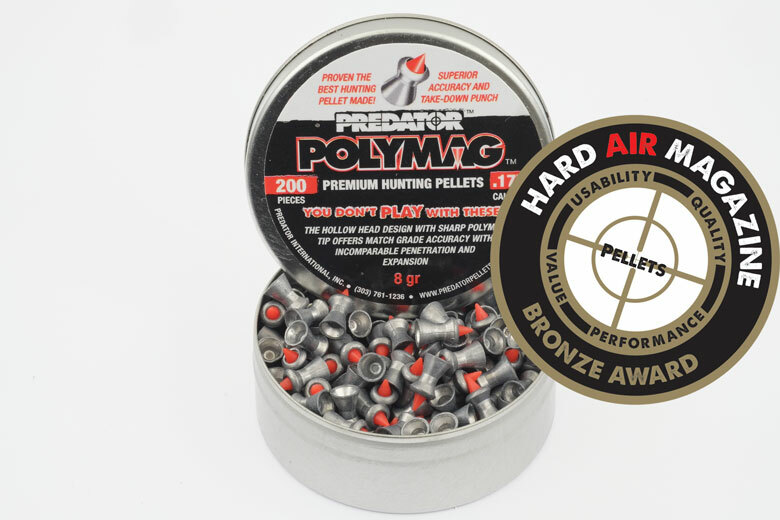 They say Predator Polymag pellets offer “match grade accuracy with incomparable penetration and expansion.” They also say that these are “proven the best hunting pellet made” with “superior accuracy and take-down punch”. As is well-known, HAM pellet tests do not include accuracy testing, as this is a result of the complete “shooting system” of airgun, pellet, scope, shooter and environment. However the good manufacturing consistency demonstrated by the Polymags we tested does indicate that they should be accurate in many airguns. Expansion into the HAM standard soap block was very considerable and would result in massive target trauma, as claimed. The fired pellet had doubled in diameter to 9.08 mm from 4.53 mm when unfired. This – in itself – will make the Predator Polymag a devastating hunting pellet within its intended range of targets. The tin of Polymags tested by HAM contained 199 pellets. This compared to the claim of 200 pellets made on the label. Pellet weight is given as “8 Grains”. The average weight of the Polymags tested by HAM was 8.18 Grains. Given that the claimed pellet weight is given only to one significant figure, the pellets tested by HAM met that claim. 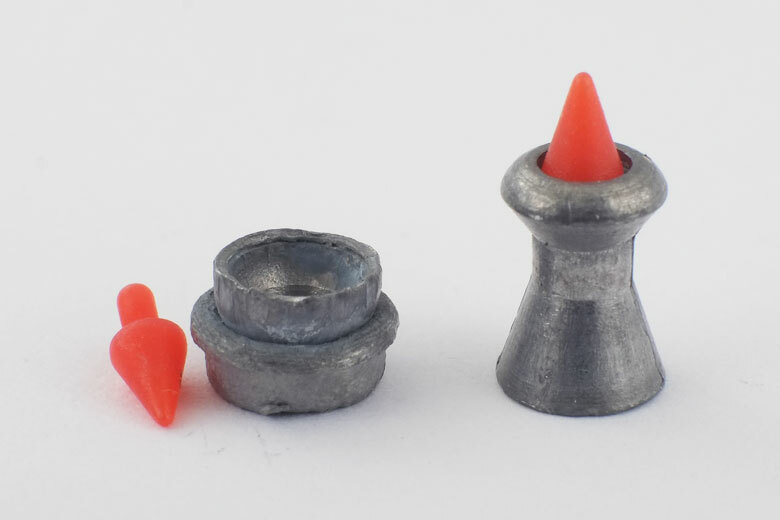 Head diameter consistency was a strong suit for the Predator Polymag pellets tested by HAM. No less than 92% of the tested pellets had the same 4.53 mm head diameter. That is the sort of figure we would expect from match-grade pellets. 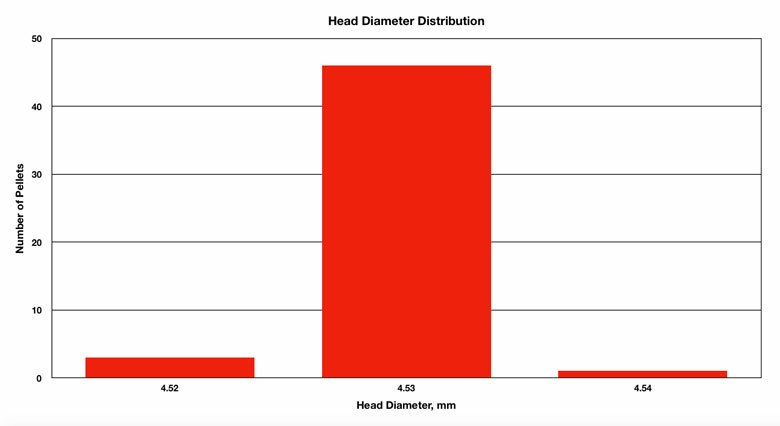 Variation in length was also minimal at just 0.44% between the smallest and largest head diameters tested. Variation in weight was about average for the Predator Polymag pellets tested by HAM. 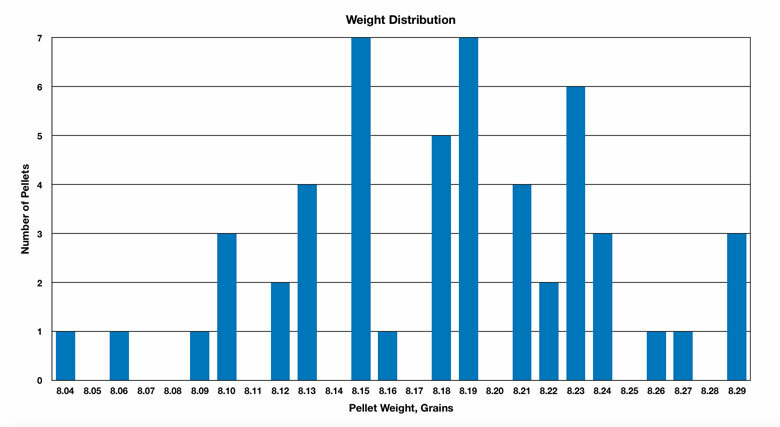 As can be seen from the chart below, the most common weights were 8.15 and 8.19 Grains. 14% of the pellets tested were found to have either of these weights. This is an above-average performance. The variation in weight between lightest and heaviest was slightly worse than usual at 3.11%, however. As always, weight measurements were made using HAM’s incredibly-precise, laboratory-grade milligram balance. 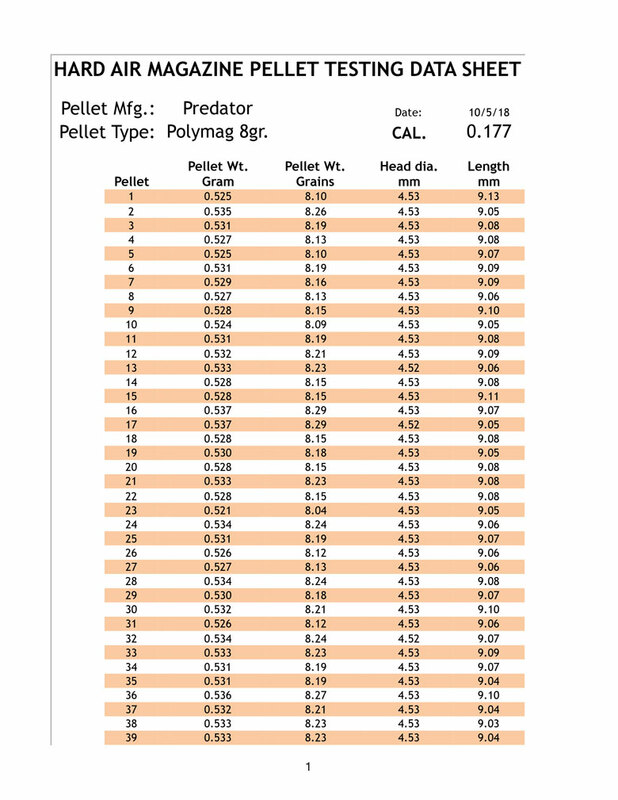 It’s clear that manufacture of two-part pellets like the Predator Polymag carries the potential for more manufacturing variability than conventional, one-piece pellets. However, length consistency was also good in the pellets tested by HAM. 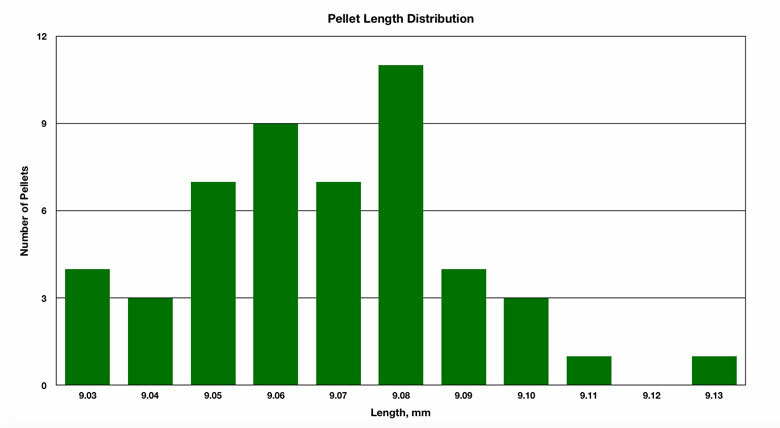 22% of the tested pellets had the same overall length of 9.08 mm – that’s an average figure. However, the variability in length between the shortest and longest pellets tested was just 1.11%, which is an excellent figure! The Predator Polymag pellets tested by HAM showed less than average dirtiness which – of course – is good. There was just 0.170 Grains of manufacturing junk per 100 pellets in the tin tested by HAM. 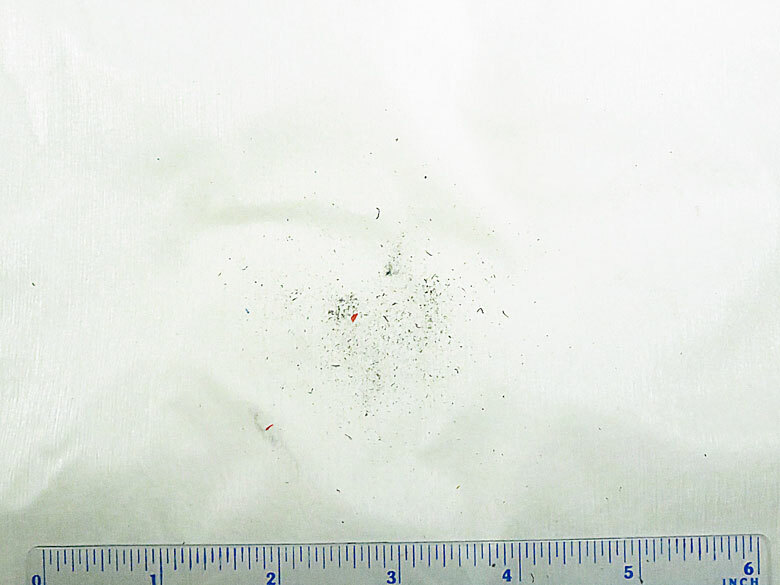 As the photograph below shows, the majority of this was lead dust and shavings. However, there’s a few red polymer shavings also. In spite of this, all normal handling precautions should be taken, as with any other lead pellets. 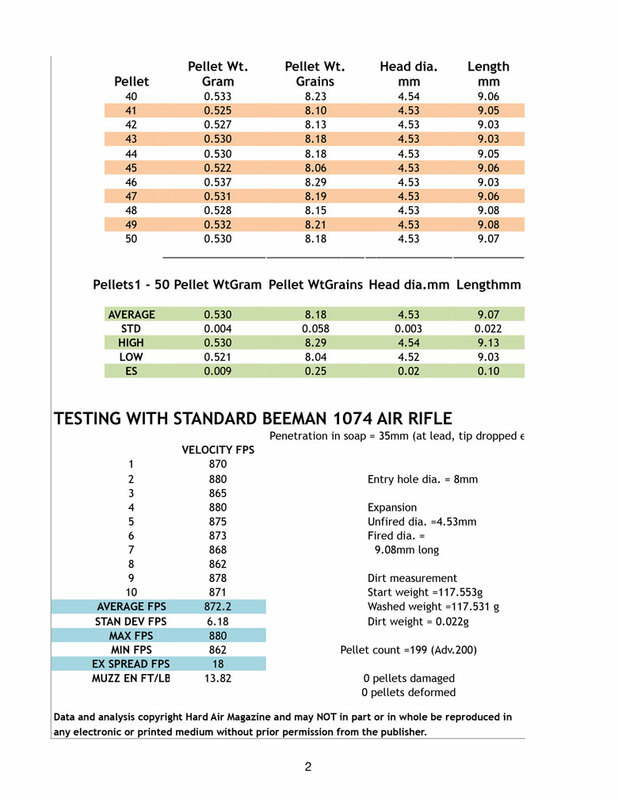 When fired from HAM’s standard Beeman 1074 test gun, Predator Polymag 8 Grain .177 caliber pellets had an average Muzzle Velocity of 872.2 FPS. The low Standard Deviation of 6.18 FPS is a result of the good manufacturing consistency of these pellets. With a Ballistic Coefficient of 0.012 found from HAM testing, these Polymags shoot effectively “flat” from 11 to 39 Yards, as shown by Chairgun. 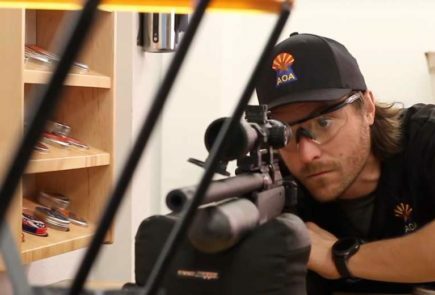 But, even at 35 Yards, the Muzzle Energy has been reduced by 50%. This makes these Polymags most effective as a relatively short range hunting pellet. HAM’s standard soap block penetration test showed Predator Polymag pellets to give up their energy very rapidly in the target. This led to limited penetration, but large expansion of the lead skirt. This limited penetration is by design. The limited penetration is a function of this significant expansion, ensuring maximum shock effect in the target. The lead skirt penetrated 35 mm into the standard HAM soap block. The tip separated inside the target and traveled less far. 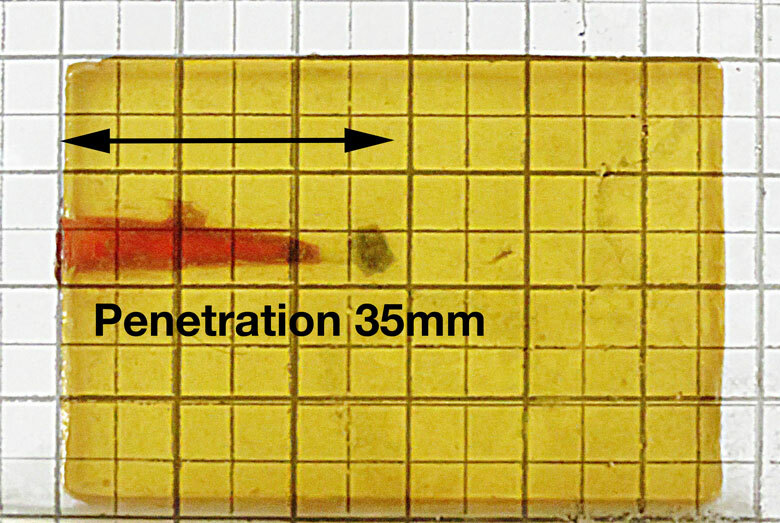 The polymer tip separated from the skirt in the target medium and traveled less far. It ended-up pointing backwards, as can be seen in the photograph below. This close-up photograph graphically illustrates the manner in which the central, necked part of the lead skirt expands and flattens on impact. This would lead to devastating wounding of the quarry and a high probability of a humane one-shot kill when hunting. 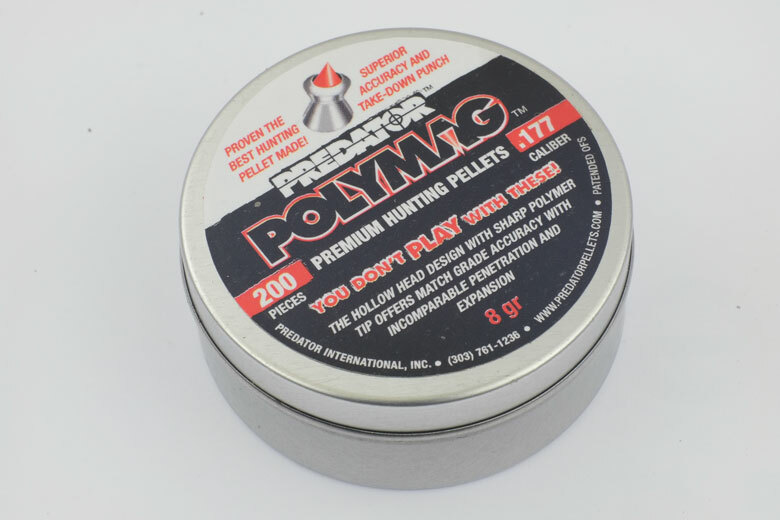 Predator Polymag 8 Grain .177 caliber pellets are supplied in small tins of 200 pellets. There’s a foam sheet in the top to provide padding in transit. Tin size and padding are obviously suitable as no damaged or malformed pellets were found in the tin tested by HAM. As ever, we don’t like the push top tin lid! This is – in the HAM Team’s opinion – always less satisfactory than a screw-top tin. We recommend transferring Polymags to a good quality pellet pouch, or pre-loading into magazines for use in the field. Finally, you’re very unlikely to find Polymags in your local big box sporting goods store. However, they’re readily available for purchase online.